"M45 + DB = Yay!" I truly appreciate your inspiration by one of the most gorgeous sites of our night sky as well as your creative tribute to it. The nebulosity is wonderful. Finally got around to commenting on this render, one of my favorites. This piece actually inspired me in my own creative pursuits. Thanks again, Ryan. This piece is truly amazing. You have an inspirational gift. I love Sisters. 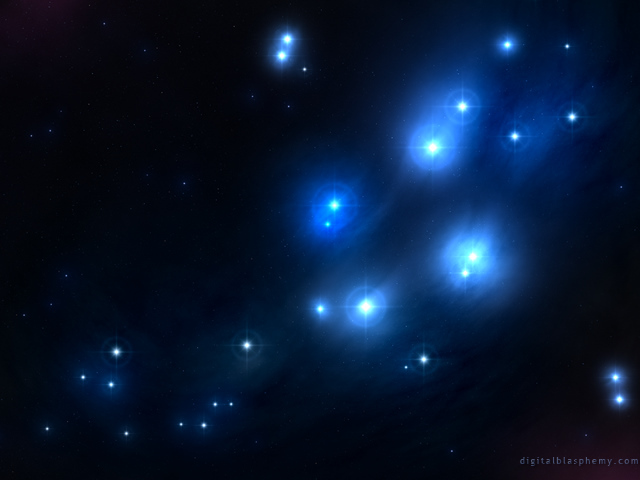 The Pleiades is a very interesting celestial grouping. How about doing Cassiopia when you get some time. Your star/planetscapes and abstracts are what keep me here Ryan, I love these! Especially this one!! Afraid this one does nothing for me, not even sure what i,m to be looking at, for the first time in in a long time Ryan -0/10..
Ryan, I realise that you live in the nortern hemisphere and Christmas for you is all about snow, St Nick and a sled. Where I and doubtless many other members live is in the southern hemisphere (Australia in my case). Please allow that for us Christmas day will see around 40 degrees celcius so the reindeer will die of heatstroke. Can we have a summer heat version of your 2009 Christmas offering?? 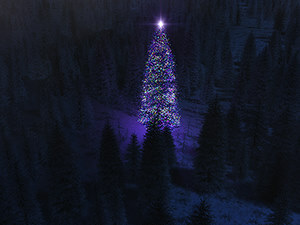 I hope to work on a Christmas image as soon as the new new server is humming along on its own (hopefully soon). I do have a few ideas so that part won't be hard! I was just wondering when you were coming out with a new Christmas backdrop for 2009? Keep up the great work it's the only backdrops that I us. I have to agree with Nate F's post. With the exception of Desert Dawn, Dark Wings and Beginning of the End, 2009 has been a very disappointing year. This wallpaper lacks creativity, there's nothing particularly special about it. The background is great, but the stars themselves look like they've been thrown on with some "free star brush" from DeviantArt. Really disappointing. There is a huge gulf in quality between wallpapers made in 2008 and 2009. If the next wallpaper shows the same amount of effort as this one (almost none), don't expect me to renew my membership next year. The Pleiades have always been one of my favorite celestial bodies. Great picture! I asked this on another news post comment but never got a response. Is there any chance you could do 3360x1050 renders for us with dual 1680x1050 monitors? Or, at least, do a resize as a professional graphic artist? As a bonus, it would mean you could put properly sized watermarks on that wouldn't be concealed by the taskbar after resizing. "Hey, what about some more color in the version for those of us with only one monitor?" I just put the dual widescreen version on my computer at work, and I simply can't stop staring at it. The detail is astonishing! So, "Oooooh....Pretty" x2! As a student of astronomy, this is spectacular. The blues of the reflecting dust and the reds of ionized gasses really shine through absolutely spectacularly. I'd love to see you tackle one of the Orion Nebula, maybe around the Trapezium region. 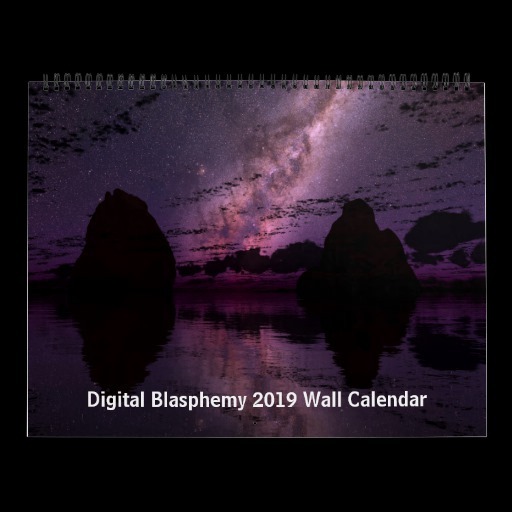 Been looking forward to the triple screen wallpaper, but the watermark doesn't seem to be quite aligned properly for the middle display in the 3840x1024 version... anyone else notice this? On mine it *just* drops over the edge by a couple of pixels. A minor irritation on an otherwise great background. PNG file is available now. I really need to find a new way of keeping all of these files straight! Is anyone else having trouble with the PNG? I cannot seem to grab it. This one is wonderful otherwise! Just downloaded the dual screen as soon as I saw it available. I think I'll be keeping this as my desktop for a while. I've been switching among the various abstract and space scenes... but I really love this one. My first thought when I saw this: "Oooohhh.... pretty...." Great job Ryan and a belated Happy Thanksgiving to you and your family. I adjusted the image in an image editor and got some extra details to appear. I love staring at real stars, so this is a nice image when I can't watch the skies. I think your watermark is fine. Though, my screen is only 1280 x 1024. Maybe that's a difference for some. but it's growing on me and it got a compliment from the wifey :) Does remind me of going up to camp with a telescope and looking at the stars. It looks a lot better now in a darker room than it did during the day when it was bright. My only complaint is that the 1920x1080hd seems cramped. It looks better when I used the 1920x1200 even with the little extra distortion so that the stars at the top aren't cropped. It just seems more centered & bordered. Even if the image was shrunk a little to get more of a border for the 1080hd version would make it look a little better I think. space scenes are/have always been my fav. before my wife and i go to bed we watch 20/30 minutes of the history channels hit TV show, The Universe. side note: i like having the new backgrounds on my iphone just as much as i do on my computer. Its proven to be kind of a hassel to sync up just to upload one background into the phone. WHATS UP ON A DIGITAL BLASHEMPY IPHONE APP?! This looks so-so. I would rather like a planet scape like Planitia. Otherwise, 8/10. Ha, I'd forgotten there was Gamma correction in Photoshop. Thanks Ryan! Looks great now. never mind my watermark opinion on my post bellow..
"@Ryan (Sisters) Da Vinci Quote!" art is never finished... i wouldn't say it any better! well i suppose this one is a simple one! but i think is fine as it is! and the water mark is fine for me but then again i have a huge desktop space! solution? Maybe if Ryan scales down the DB mark as the resolution goes down to compensate the lack of space!! I really like the subtle glow in the upper left and lower right corners. Looks beautiful on my widescreen. I believe when people talk about watermarks they mean Ryan's website/copyright notice on the bottom right. I'm not sure why unless it's a new web term and I'm way behind the times -- in the past watermarks were identifying marks impressed on paper during manufacturing, which were visible when the paper was held up to the light. If you had an image editor (and the inclination to do so) you could adjust the gamma of the image itself to your liking and then you could leave the rest of your settings alone. The sad fact is that, especially for darker images such as this, how my work looks depends a lot on your monitor settings. I turned my gamma up based on Ryan's comment below, and it certainly made a difference! There's much more detail then I had previously noticed. However, everything else looks crap, so I turned it back up. I have always been a major fan of the abstract and the planetary/stellar pieces. This is beautiful. Personally, I love �Sisters� the Pleiades are my favorite astronomical objects. I always love the space scenes and of course blue!! On my monitor it looks great with the nice dust clouds. I like the simplicity of it too. Added to my favorites list :). Something of a divergence of opinions here. I wonder if this one is losing something when I lower the resolution for smaller monitors. I'm not sure what people are referring to with the watermark. It looks the same as it always has to me. Hmmm. I thought I put quite a bit of detail into this, but perhaps it is not showing up on everyone's monitors due to different gamma settings (etc). I can certainly see how if your monitor is set even just a shade darker than mine this one would look pretty boring. 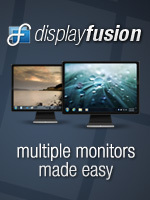 Check out Display Fusion (if you're running Windows). I have a quick question. My current setup is dual 1920x1200 monitors, but my right one is the primary. Is there a quick way to properly display the dual monitor wallpapers? Right now the only way to do it is to open the wallpaper in a photo editor and switch the two sides. "LOVE IT...Just got back from a 4 hour drive in my Subaru!" Love this image. It is perfect...and fitting for it is my birthday tomorrow and this image represents me in so many ways! Fav Color = Blue. I'm from the mountains, so I always gazed at the stars growing up. Just got back from a 4 hour trip in my Subaru, which is represented by the Pleiades constellation! Sorry as well. Looks like the art you made in 2000. Will look forward to your next piece. Still a big fan though. I love the space scenes! Definitely not a fan of this one. Good effort, but it's definitely lacking something. Still very pretty, but not up to your usual excellence. I love your space scenes so much. This... is just fantastic. It's so simple and perfect! Sorry Ryan, this just isn't one of your best. Cool, but not terribly interesting. I also agree with previous comment that says the watermark still isn't right. Sticks out way too much. Serene would be the word I use to describe this one. I probably won't be keeping in on my desktop too long, due to the simplicity, but it looks very nice. Kudos. Wow, Ryan, this is terrific! I love your space art, but this is extra special. Another thing to be thankful for on this holiday weekend! I'm sure I could improve it but, well, check the Da Vinci quote at the top of the new images page. I've always loved your space wallpapers, and this one is no exception. Great job! Looking forward to more in the future. and the color is the best color as usual!! tho i bet you can improve it! Ryan, this starscape is, in my opinion, one of your best works. It's subtle and feels spacious, yet retains the silent majesty of space. Well done. On a side note, it's my birthday today. What a present, eh? Not sure why, but I get a peaceful feeling when I look at this one. Can't wait for the dual monitor one. Loved your space based wallpapers. 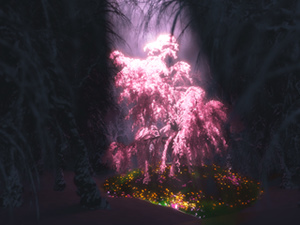 "Yuletide (2007) -- Christmas 2007"